Lawyers for former Virginia first lady Maureen McDonnell say her marriage had broken down by the time a former CEO began to lavish gifts on her -- and he became her "favorite playmate." The bombshell was revealed Tuesday during opening statements in a corruption trial against Maureen and her husband, former Virginia Gov. Bob McDonnell. The former first couple is charged with taking more than $150,000 in gifts trip and loans from Jonnie Williams, former CEO of Star Scientific, in exchange for promoting his company's new dietary supplement. One of the first witnesses called by the prosecution Tuesday was the couple's daughter Cailin McDonnell. It was Jonnie Williams' $15,000 gift to her before her June 2011 wedding that later set off a federal investigation into first couple. As prosecutors questioned her, Cailin said she'd met Williams just once before her mother called to say he wanted to pay for the catering at her wedding reception. It was then that he was added to the guest list. Cailin later broke into tears on the stand as the prosecution questioned her and showed her pictures of the wedding that is now forever linked to her parents' indictment. The McDonnells were charged in a 14-count indictment in January and are being tried together after a request to have separate trials was denied. The couple arrived separately at federal court over the past two days, a sharp contrast to the united front they showed when they were indicted 10 days after he left office in January. Before the trial, they often held hands in the courthouse. Maureen's defense attorney, Bill Burck, said during opening statements Tuesday that not only was the couple's marriage a wreck, but that Maureen developed feelings for Williams as he took her on a designer clothes shopping trip and showered her with attention. "You'd even hear she had a crush on on him. Unfortunately, unlike the other man in her life, Jonnie Williams paid attention to her," Burck said. He also told jurors that there couldn't be a conspiracy between the McDonnells because they were hardly talking back in 2011 and 2012. "At the time of the conspiracy, the McDonnells' marriage had broken down; they were barely on speaking terms," Burck said. He said Maureen had been feeling increasingly uncomfortable and didn't feel like she was up to the task of being the wife of the governor. That's when, Burck said, Williams swooped in. Burck said Williams was a frequent visitor to the executive mansion for meetings with Maureen -- even upstairs in the private quarters -- as he worked to get close to her to make a connection with the governor to try to promote his product. Burck said Williams and Maureen frequently exchanged text messages and phone calls, and that Williams often visited the executive mansion. 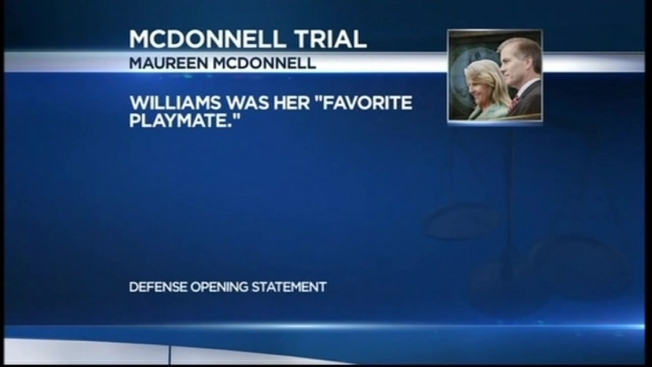 Burck said the pair had a relationship that "some people would consider inappropriate" and that one potential witness may describe Williams as Maureen McDonnell's "favorite playmate." He did not indicate that their relationship was physical. But Burck said Maureen was a true believer in his dietary supplement Anatabloc and had, for years, been sold on the virtues of "nutraceuticals." "She accepted first because she liked Jonnie Williams quite a bit and thought that he liked her too," Burck said. He argued that Williams duped Maureen McDonnell -- a claim echoed by John Brownlee, a defense attorney for Bob McDonnell. "Plain and simple, ladies and gentlemen, Jonnie Williams deceived Bob McDonnell," Brownlee said during opening statements Tuesday. "Jonnie Williams deceived and manipulated Maureen." Brownlee said that prosecutors went to great lengths looking for people to say bad things about his client, even sending investigators to interview former presidential candidate Mitt Romney and his wife, and "came up empty." McDonnell had been a rising star in the Republican party and widely mentioned as a possible Romney running mate in 2012. Brownlee said that Bob McDonnell will testify on his own behalf and will read an email in which he begged his wife to work things out with him. "[The email] fell upon blind eyes and deaf ears because that evening, Maureen was distracted by other interests," he said. Brownlee also said Maureen McDonnell was upset over financial issues and because the couple wasn't spending enough time together. "Bob McDonnell was a good governor... but evidence will show he was not nearly as successful as a husband," Brownlee said, adding that Maureen McDonnell was so angry at her husband for the time he devoted to his job that she once told him she hated him. "She was angry at him for not having enough money; for not spending more time at home with her; for working night and day, and not having anything left for her," Brownlee said. Brownlee also attacked Williams' credibility, calling him a "master manipulator" who deceived the McDonnells and the government to receive immunity. But prosecutors told the jury they will present a different picture. Assistant U.S. Attorney Jessica Aber said during opening statements that McDonnell and his wife betrayed the public's trust by lining their pockets with "secret gifts and cash." McDonnell, who left office in January, had a duty "not to sell the power and influence of his office to the highest bidder," Aber said. "Mr. and Mrs. McDonnell knew what Mr. Williams wanted and gave it to him," she said. Aber said that prosecutors will prove that the first couple conspired to get gifts and money from Williams -- whom she called "a vitamin salesman" -- because they were in financial trouble. "There is nothing wrong with the governor promoting Virginia business," Aber said. "Mr. McDonnell's campaign was 'Bob's for Jobs' ... it was what he was supposed to do. Just not in exchange for money." The prosecution claims that Maureen McDonnell was the first to ask Williams for money, but that Bob McDonnell himself was asking Williams for money by the end of February 2012. Prosecutors say that he will admit he initially lied to investigators when he denied giving gifts to the McDonnells to get help with his company. He later changed his story and was given immunity. Maureen McDonnell's attorney had harsh words about Williams' changing story, alleging he told the government what they wanted to hear, to avoid being charged in a separate stock fraud investigation. Williams may have illegally sold $10 million worth of Star Scientific shares to a friend in secret, according to Burck. Federal prosecutors filed a list of 61 potential witnesses Monday morning, including Maureen McDonnell and the couple's children Sean, Rachel and Bobby. Among the possible defense witnesses are former Gov. Doug Wilder and former state Attorney General Ken Cuccinelli. The witness list and the government's list of exhibits were filed Monday in U.S. District Court in Richmond shortly before jury selection began. Joseph E. diGenova, a former federal prosecutor not affiliated with the case, said the defense team is airing details of the couple's troubled marriage as a way "to create some sympathy" and show that Bob McDonnell could have been unaware of the dealings between Maureen McDonnell and Williams. The strategy could backfire, he said. "There's always a risk the jury will think it's a ploy," diGenova said. Aber, the prosecutor, told the jury that the luxury gifts and frequent text messaging between Williams and Maureen McDonnell were "always just a business relationship and nothing more." She showed the jury a photo of Bob McDonnell, smiling broadly and wearing sunglasses, driving Williams' Ferrari during a vacation at Williams' lake house. The trial began more than six months after the McDonnells were indicted on federal corruption charges following a lengthy investigation. Before the indictment, Bob McDonnell apologized for what he described as bad judgment and said he had repaid about $120,000 in gifts and loans, but denied breaking any laws. He and his lawyers have argued that prosecutors are trying to criminalize routine and long-accepted political courtesies, like hosting receptions and arranging meetings, that fall short of more tangible rewards historically associated with bribery. Prosecutors have countered that the McDonnells' willingness to help Williams on "an as-needed basis" and Williams' expectation of something in return, whether he received it or not, is enough to support a conviction. The indictment also outlined the couple's alleged financial struggles during Bob McDonnell's time in office, and includes an email from Maureen McDonnell saying the family was "broke" and had an "unconscionable amount" of credit card debt. Stay with News4 and NBCWashington.com for more as Northern Virginia Bureau Chief Julie Carey (@JulieCareyNBC) reports from Richmond.